As expected, Apple moved its Logic Pro music production tool to the App Store. And the results are mostly what you’d expect. The biggest change is the price: Logic gets slashed to US$199.99, while MainStage gets a so-low-you-might-as-well-try-it $29.99 sticker price. Wave editor Soundtrack Pro, removed from Final Cut Studio, is gone here, too. Lesser-known mastering tool WaveBurner gets the axe. 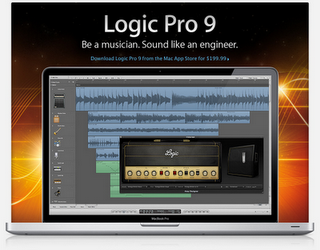 Logic Pro 9 is still Logic Pro 9. Today is a minor update that you can now download via the App Store if you choose. Logic Studio remains for sale through Apple in its boxed edition, but at two hundred bucks, the App Store version is the winner. If you were expecting Logic Pro X, my guess is, it’s just not done yet. I still expect the number ten to follow the number nine. (Amazing how that works.) I don’t expect Logic Pro X to produce the kind of disruption that Final Cut Pro X did, however. Logic already has a 64-bit infrastructure. Final Cut had an aging code base, deeply rooted in deprecated versions of QuickTime, that prompted Apple to do a ground-up rewrite. The initial results made people unusually unhappy, and perhaps justifiably so, but ground-up rewrites of software this complex tend to be ugly at first. There’s no reason to believe Logic will face a similar overhaul. Whatever Apple is doing, I’m in no rush; Logic is a deep program, and I’d rather wait for upgrades from everyone (note to all developers everywhere) than have serious production software rushed out before its time. What is notable is MainStage: there are some welcome tweaks, and absurdly-cheap, standalone pricing that should get some attention. The real changes software-wise come in MainStage. For starters, if you don’t love Logic but want to try Apple’s live performance / instrument and effect rig, you can now do that. MainStage works standalone, and you even get all the Apple Loop sound content and sample-based instruments previously available in Logic Pro – Jam Packs and all, what once could have cost you hundreds of dollars is now thirty bucks. One thing I wondered about with the App Store was how Apple would handle distribution of all that content. They’ve thoughtfully allowed you to check off only the content you want to install, saving bandwidth and hard disk space if you don’t want everything. There are also some bug fixes and improved ReWire support. None of this is really earth-shaking in itself – though it’s nice to see those patch change additions for people with hardware rigs. But the big news here is that, with MainStage unbundled from Logic, it’s in a whole new product category. It could be a viable option for Mac owners wanting to control plug-ins and hardware from a streamlined setup, even if they’re not Logic fans. And that could open MainStage to new audiences using other DAWs. Years ago, I reviewed a similar app, Rax, now marketed by Audiofile Engineering. (At the time, it was developed by Plasq, now better known for Skitch, which they just sold successfully to Evernote.) I was disappointed that no one really picked up on the app. The idea is great: make a simple, straightforward app that gets you actually playing instruments on your computer with minimum fuss. It still seems like a great idea, and perhaps now the time is right. Rax/MainStage shootout, anyone? Sometimes, it’s news that something isn’t news. For all the rumors that the App Store transition was going to be a big deal, I think for Logic users, it’s probably not. It could be a more convenient way to distribute Apple’s software. And it sure makes those days of giant Logic boxes and blue Emagic copy protection dongles seem distant, huh? But I don’t think the question is whether competitors will go to the App Store, specifically. I think the question will be more generally, when will we cease to see boxes of nothing but software in stores? It seems stores may continue to carry hardware bundles, but that software will get delivered, you know, on the Internet.